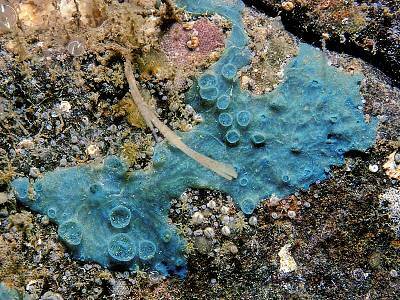 Description: This sponge grows as a small thin sheet, typically in patches of only 1-2cm in diameter. The colony usually has a very irregular outline, giving the appearance of several separate patches. 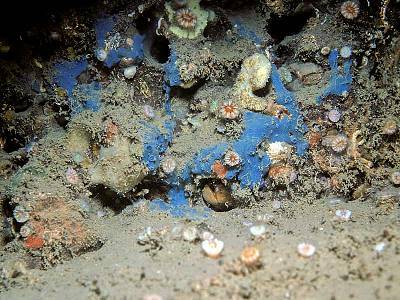 The colour of this sponge is a very distinctive bright blue or green. The surface has small pore sieves, similar to Hemimycale columella. Habitat: This species is most commonly found on lower circalittoral bedrock or boulders in sheltered or moderately exposed sites. Distribution: Known recently from scattered sites on the south-west, west, and northern coasts of Ireland, and also western Scotland. Similar Species: The combination of pore sieves and bright blue or green colour seems to be characteristic of this species. 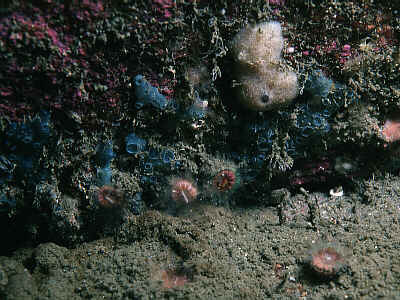 Terpios fugax is also a blue encrusting sponge, normally found in the littoral or shallow sublittoral, however this species lacks pore sieves. Bright blue or green colour. Thin sheet with pore sieves. Picton, B.E. & Morrow, C.C. (2016). Hymedesmia paupertas (Bowerbank, 1866). [In] Encyclopedia of Marine Life of Britain and Ireland.